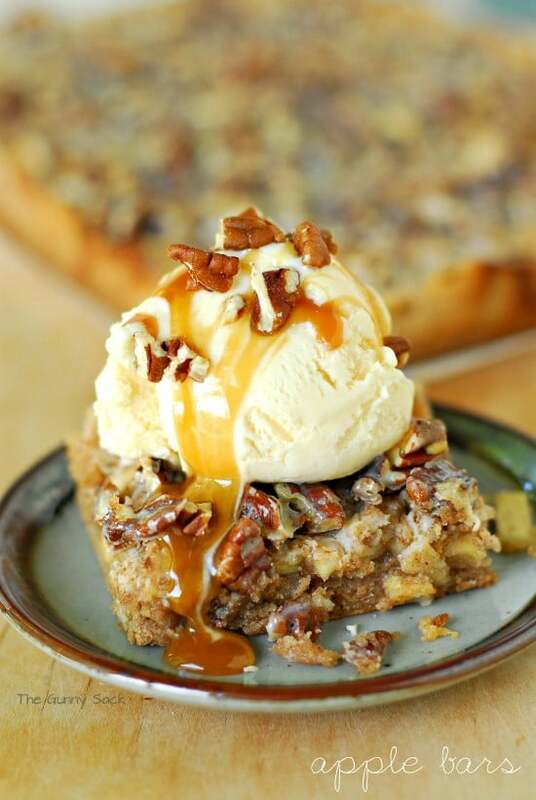 Everyone loves apple desserts during the holidays! 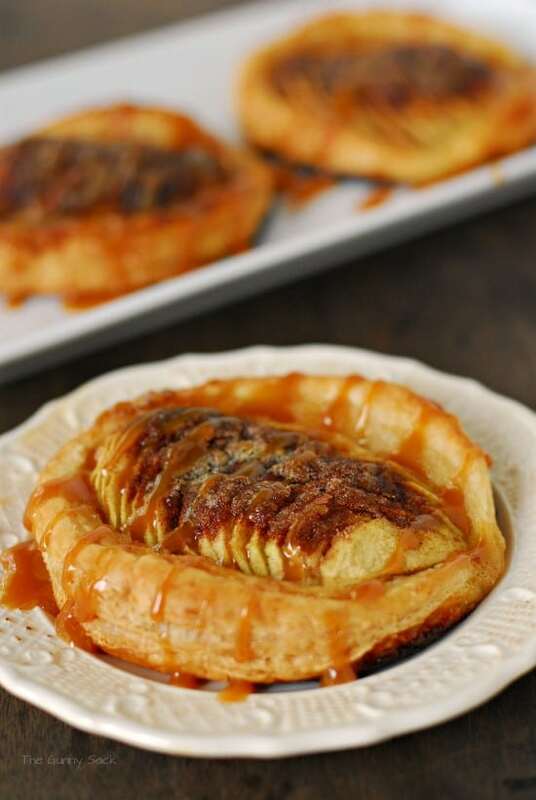 Today I’m sharing a recipe for individual apple tarts made with a puff pastry crust. Every autumn we celebrate fall birthdays with a group of friends by going out to dinner and spending the evening together. Although we do get together with our families throughout the year, every autumn we say that we need to go out as couples more often! 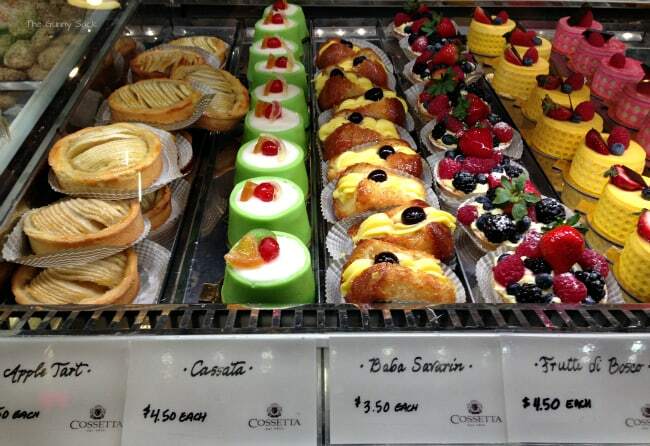 This year we went to a restaurant called Cossettas that had a huge pasticceria (or pastry shop) in it. I was amazed by all of the desserts and want to try each and every one. We were told that except for a few of the imported Italian chocolates, everything is made in their in-house bakery. There were cheesecakes, tarts, canoli, macaroons, pies, cupcakes and even gelato! Swoon! Here is a picture of one small section of the pastry display case. I thought the apple tarts on the left were adorable so I had to try making my own version. I don’t have any mini tart pans so I used puff pastry because I wanted it to puff up around the apples. I cut one thawed piece of puff pastry into 4 pieces and used a small glass bowl to cut out 4 circles of dough. 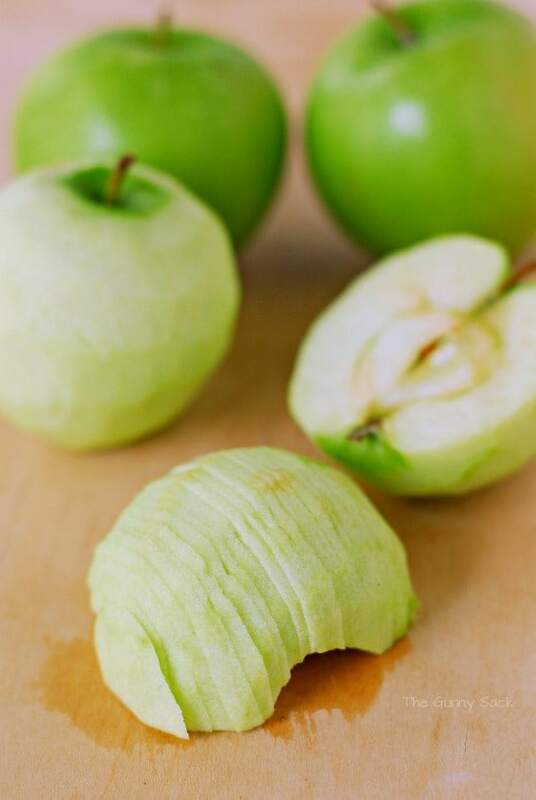 Then, I peeled 2 green apples, sliced them in half and removed the core. I cut the halves into thin slices. Put the circles of dough on a greased, or Silpan covered baking sheet. 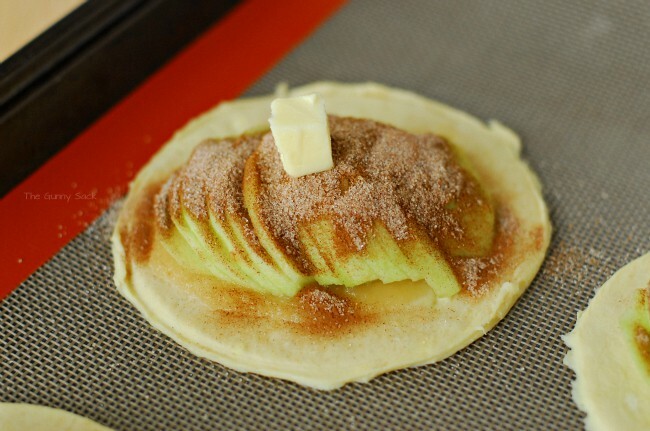 Put a little applesauce in the center of the circle and top it with apple slices, cinnamon, sugar and butter. Bake at 400 degrees for 20 minutes. Turn oven to 375 degrees and bake for 15 minutes until dark golden brown. 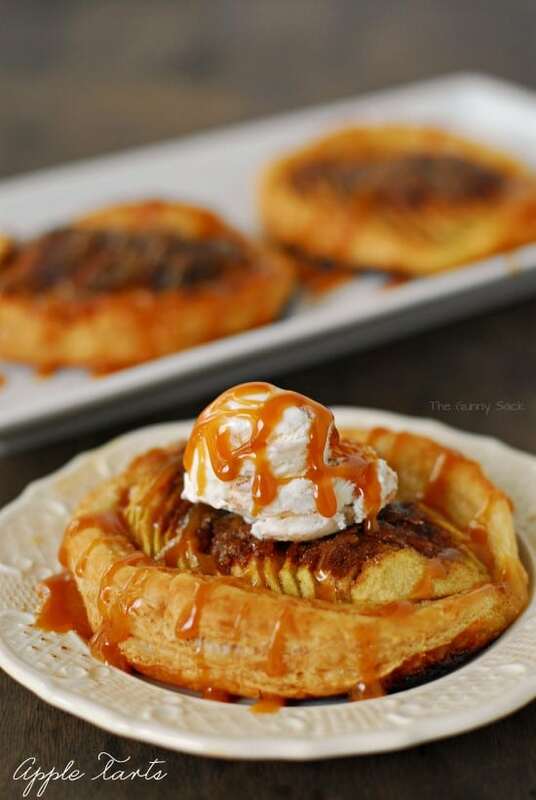 Drizzle the warm apple tarts with caramel ice cream topping. Add a scoop of vanilla ice cream and take a bite! 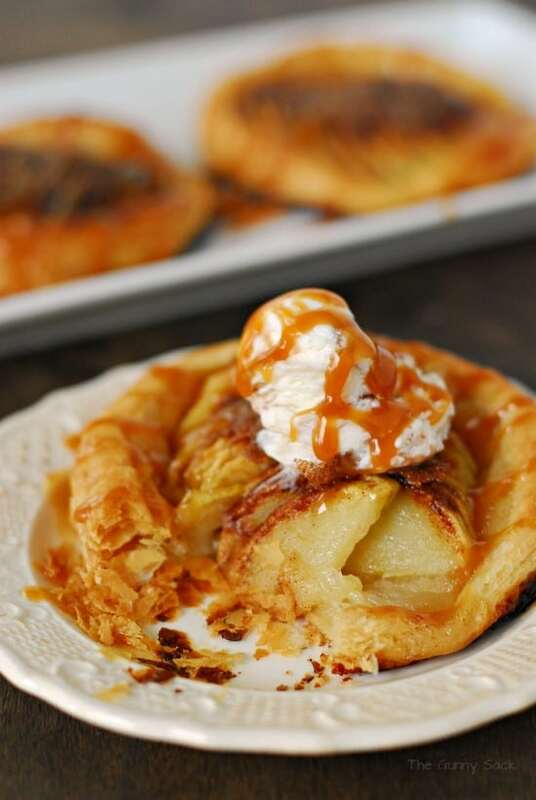 Enjoy the soft, tart apples, sweet cinnamon and sugar on a flaky pastry crust. Make this apple tart recipe for the holidays and impress your guests with this delicious dessert that looks so pretty. 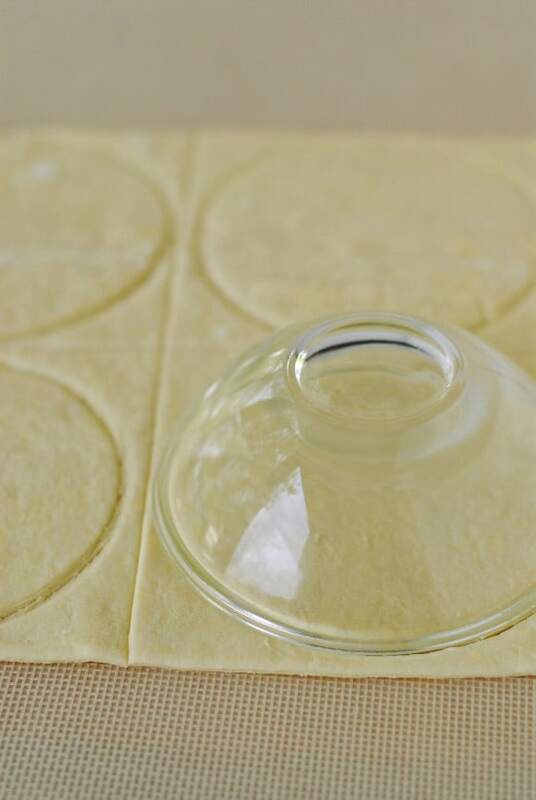 Cut the puff pastry into 4 large circles and place on a greased baking sheet. Spread 1/2 tablespoon of apple sauce into the center of the circle. Cut the apples in half and thinly slice. 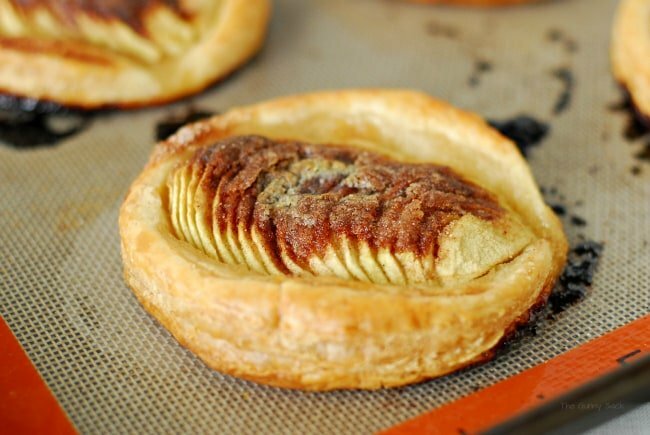 Fan apple slices into the center of the pastry circle. Mix together sugar and cinnamon and sprinkle 1/2 tablespoon of the mixture onto the apples in each pastry. Top with 1/4 tablespoon butter. I used Pepperidge Farms Puff Pastry Sheets. In one package, there are two sheets of puff pastry. I used one of the two sheets for this recipe. ok I think I love you Tonia! 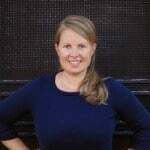 I was looking for some mason jar ideas last week for a holiday office party – and upon whose website did I stumble? Yes, your fantastic “cleans up well” jars were a big hit! And now today I’m looking for apple tartlets for a Christmas dinner and again, here you are! I can’t wait to make these – exactly what I was looking to find. I think from now on I’m going to stop using Google and just start on your page whenever there’s a project that needs to be done! Keep up the good work. Ooooh Tonia. These are gorgeous. I’m so in love! We just went apple picking today. This would be a great use for them! Thanks for the link love! What a gorgeous tart! I NEED this right now for lunch! Oh, this looks so delicious!! these look so delicious – I gained 5 lbs. just oogling the pictures. 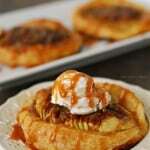 I have to make these today, it is a chilly fall day _ a perfect time for making apple tarts. Thanks Claire! I hope they turned out well! They were just yummy! I even gave some to my neighbors….I am usually to shy to or insecure to give an item I bake to my neighbors. Thumbs up from everyone! Thanks so much. 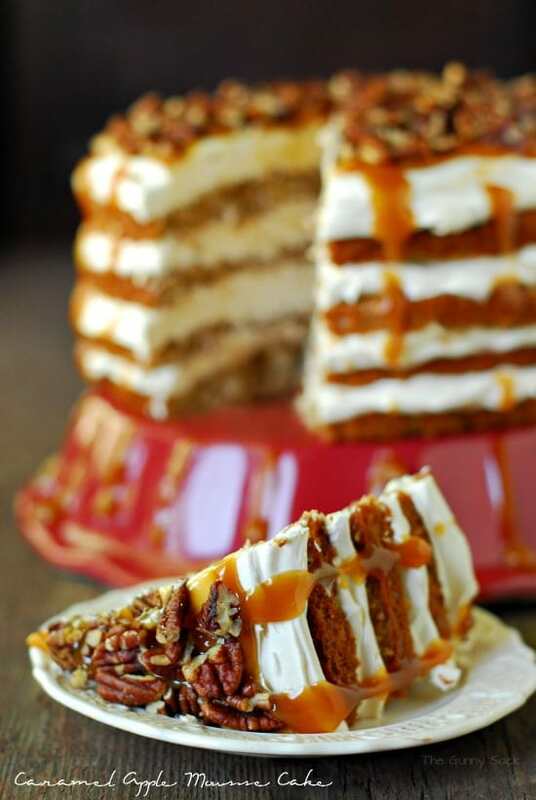 I can eat apple desserts all year round Tonia and will definitely be giving yours a go. Delicious! I agree! But I guess I pretty much like all desserts, all the time. Why can’t they be good for our diet? Thanks Katie! I wish I could send you one! They’re beautiful Tonia! And look seriously delicious! Pinned! Gorgeous tarts! And even better all savings of making them at home-not to mention how you know exactly what’s in these goodies. Tonia,the Apple Tarts look like they melt in your mouth. You really are Awesome. You must have the HAPPIEST Family & Friends EVER!!!! Thank you so much Anna! Yes, I shared these with my family when we got together for my dad’s birthday and they loved them!